Original description: Haidinger, W., 1828. On Herderite, a new Mineral Species — The Philosophical Magazine 4: 1—3 [view in ‘Library’]. Type locality: Sauberg mine, Ehrenfriedersdorf, Erzgebirge, Saxony, Germany. Etymology: in honour of Siegmund August Wolfgang von Herder, Freiberg, Germany. Distribution: Brazil is a primary source for facet-grade rough. Essential elements: hydrogen (H), beryllium (Be), oxygen (O), fluorine (F), phosphorus (P), calcium (Ca). Crystallography: monoclinic — prismatic. Crystal habit: pseudo-orthorhombic crystals (Anthony et al., 2001—2005). Cleavage: indistinct. Fracture: conchoidal (Arem, 1987: 111). Tenacity: brittle (Arem, 1987: 111). Hardness: 5—5.5 (Arem, 1987: 111). Density: 2.95—3.02 g/cm3 (Arem, 1987: 111). Luminescence: fluoresces violet under UV; cathodoluminescent and phosphorescent (Anthony et al., 2001—2005). Colour: light green; colourless in transmitted light (Anthony et al., 2001—2005). Diaphaneity: transparent (Anthony et al., 2001—2005). Lustre: vitreous (Arem, 1987: 111). Refractive index: 1.587—1.642 — anisotropic [biaxial (+/-)] (Lazzarelli, 2012). Birefringence: 0.028—0.032. Dispersion: 0.017 (Arem, 1987: 111). Pleochroism: none or weak (Arem, 1987: 111). 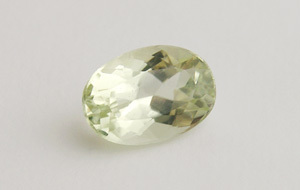 1 specimen: 0201 — 1.49 ct, Brazil.